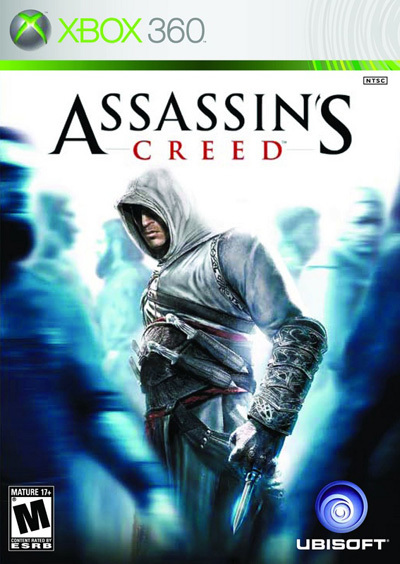 So initial thoughts on Assassin's Creed is that it's a bunch like Prince of Persia. Then I realized that the same people developed that as well...makes sense. Second thought: "Do I really need to ride the horse everywhere?" Let's start from the beginning shall we? Graphically the game is beautiful. All the people walking around doing their own thing. Cool stuff. Altair is the best looking of all, of course. Some of the townspeople look kind of bland in comparison. Then you begin to realize that there's only so many templates and that there's a lot of the same person walking around. Small enough a thing that it doesn't ruin anything, but a bit of a quirk. Animations are very smooth, especially when climbing and jumping around on stuff. Crowd interaction is also a very big part of the technical part of the game, but didn't come into play much during the actual game. Running and jumping around the city is easy enough, but the combat is still a bit clunky. Better than the PoP games, but not super smooth. Towards the end, it involved waiting for one of the many patient enemies to attack, then countering it for a quick kill. Again and again. Repeatedly. After about the third assassination, you'll come to realize that you've already seen what the game has to offer in the gameplay section. Thankfully the story saves this one, but we'll get to that later. The same missions present themselves to you as you climb high points throughout the game. I went through all of them because I'm a bit of a completist, but I probably could have finished the game significantly quicker if I didn't. I was rewarded in the end with more Acheivement points, but I'm not sure it really impacted the rest of the story. As I could tell the game was coming to a close, I was fighting just to finish it. Luckily I didn't buy anything new or it probably would have hit the shelf and stayed there. One man has only so much patience for pick pocketing, fighting guards, and evesdropping before he will go insane. The story does push things along nicely. A very nice twist comes towards the end about who's who and what's really going on. Both in the current day and in Altair's time. While the current time story is neat and everything eventually ties together, you can really only walk around one room so getting back to the past memories is more exciting. The biggest drawback of the game however is the ending. Even if you waited until after the credits for the "Secret Ending" it's not much and just ends on a really horrible cliff hanger. Not even a shocking moment, just an end. It's like saying "Hey, glad you finished it, be back next year with $60 and we'll let you in on a little more." Super Bummer. In all, I really enjoyed my time with Assassin's Creed, but the few graphical glitches along with the repeating missions definately detract. Then the ending really kicks you in the gut when you realize that there's no payoff...at least not yet. To it's merit though, I am excited for the sequel, but also bummed out that I have to wait for a sequel to have anything explained to me. At least that's the plan. As long as it doesn't turn into Lost with all questions and no payoff. 4 out of 5 throwing knives!